They’d spent the day unloading a moving van. But as Steven Andrade, M.D., and his pregnant wife, Allison, went to bed that night there was still much to do. “We had something like 90 things scheduled on the calendar for the next day,” said Allison, rattling off a to-do list that included closing on their new Knoxville home, scheduling contractors for a renovation project, meeting their son Paxton’s new daycare teacher and an appointment at Fort Sanders Regional Medical Center, where her husband was to start his career as a new perinatologist. Sometime after midnight, the “91st item” was added to the top of the list: welcoming their 6-pound, 9-ounce daughter, Lyla Mae, into the world. “I like to do everything at once,” Allison would later say with a laugh, explaining the panic she felt when her water burst. Unfamiliar with their new hometown of Knoxville (they had arrived only two days earlier from Winston-Salem, N.C.), the Andrades let the GPS guide them to Fort Sanders Regional. 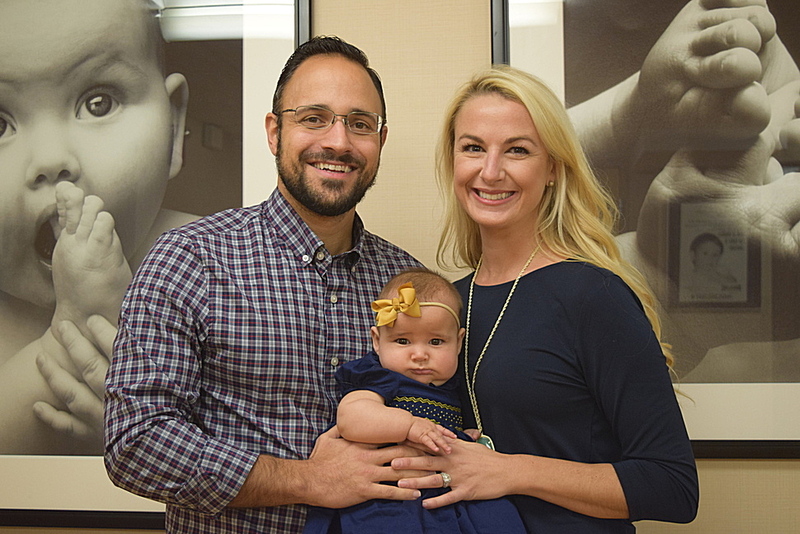 There, Dr. Andrade had first-time meetings with two of his OB-GYN partners from Fort Sanders Women’s Specialists: Robb McKeown III, MD and Brooke Foulk, MD who would deliver Lyla Mae. Dr. McKeown and Dr. Foulk treated the Adrades with the same excellent care they provide for all of their patients. “Despite having to take care of the brand new perinatologist’s wife, they were cool as cucumbers and did a great job and really treated us like they treated any other patient. It gave me somewhat of an insider opinion before I saw it from the other side,” Dr. Andrade said. Those hectic days are behind him now, and Dr. Andrade sees them simply as “the plight of any physician” early in his or her career. Allison Andrade, whom many would say had the most difficult job, remains blissfully happy with her new bundle of perfection. Learn more about the women’s services offered at Fort Sanders Regional here.